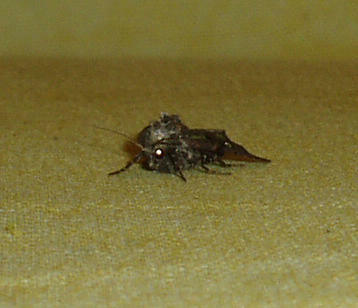 This fly was a resident of Great Barrington, MA when I photographed it. 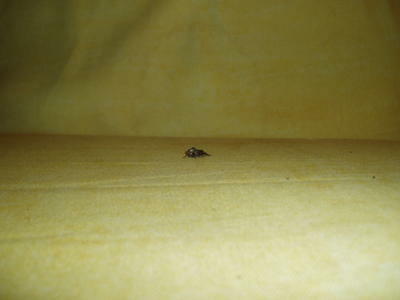 It lay very still for its portrait, and we wondered if it was dead, but it did fly away after a minute or two. Maybe it was on its last legs. That's the full photo. Compare with the photo below, which appears in Michael Light's coffetable book, Full Moon. That's the lunar module Challenger, sitting on the moon in December 1972, during the last of the moon missions, Apollo 17. Geologist Jack Schmitt took this picture with a 500-mm lens while almost 2 miles away from Challenger, which is about 23 feet high. The mountain in the background, the South Massif, of which we can see two white slopes rising steeply, is another 5 miles back. Even the darker embankment between Challenger and the white slopes lies nearly 4 miles behind the lunar module! The remains of Challenger are still sitting there in the Taurus-Littrow Valley, which was formed when a large meteor struck the moon nearly 4 billion years ago and left mountains on all sides. The photo captures the full width of the valley. I downloaded it from a website that has a great archive of Apollo photos. On the web there's also a 360-degree panorama of the valley. 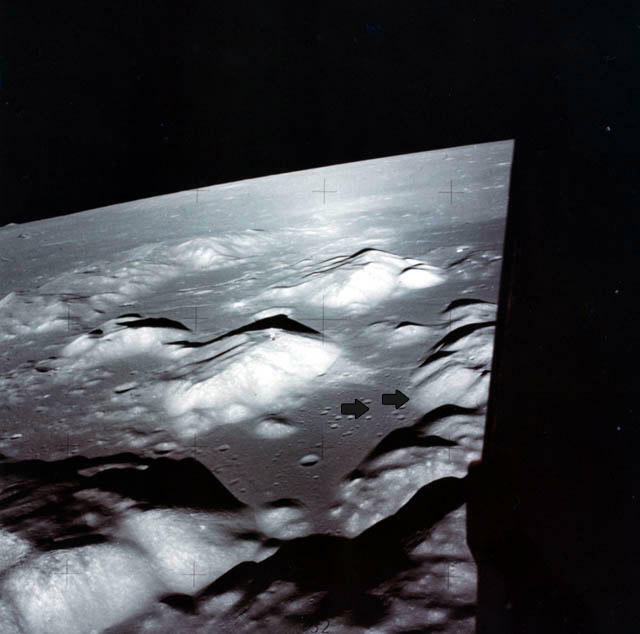 Below is a photo of the valley from lunar orbit. I've marked off the spot where Challenger later landed (near the middle of the plain), and the spot where the photo above was taken (at the foot of the mountains to the right). The first lunar module produced, for Apollo 9, was nicknamed Spider. The most famous of the spiders was the Eagle, seen here with Buzz Aldrin. Now have a close look at the next photo, from yet another mission. This is David Scott, the commander of Apollo 15, in the summer of 1971. The mountains behind him, known as the Swann range, are 10 and 1/2 miles away. The distances in these photos are so deceptive, as the astronauts reported experiencing during their visits. 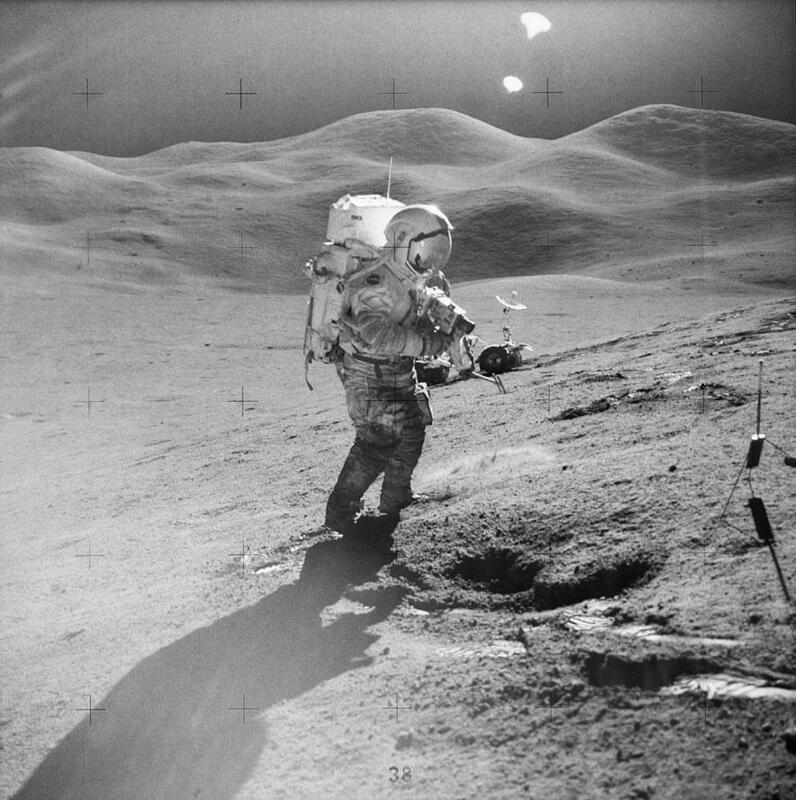 It makes the Apollo photos doubly interesting; you don't know exactly what you're seeing, at first sight. 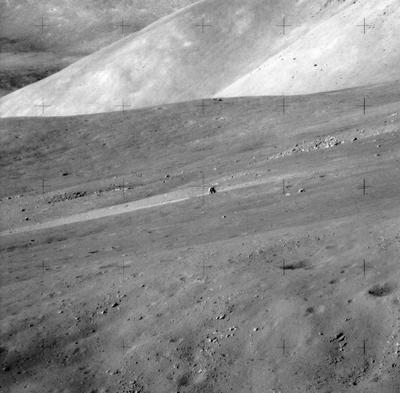 Before reading Michael Light's book, I had always assumed the mountains in Apollo photos were hills. But there are no familiar objects on the moon to give a sense of perspective. A few weeks ago I was showing my 9-year-old nephew some Apollo photos. I explained that if you were to look at a mountain on earth, you would see valleys, rivers, forests, roads, and perhaps clouds in front of it. That's how you'd know that the mountain was very distant. Remove all those things, and there's no way to know. You could make your way toward an apparent hill and find yourself walking a very long time. The plain in front of you would open up endlessly, tirelessly offering up craters and boulders, and more ground, until you arrived at the base of a 15,000 foot mountain. I remember being deceived by distances in the Sinai desert, where there are comparatively few objects to give perspective -- fewer than in the American Southwest, which is less deceptive. But the Moon must be something else.